Good play or lucky play...I dont care! Yar, to port with me!! Where was that yesterday, Ian? 1st Barrrrrryce Harrrrrrrrrrrrrper homarrrrrrrred to right centarrrrrrrr, Ryan Zimmarrrrrrrman and Jayson Warrrrrrrrth scored. 6th J Ruggiano doubled to left, G Stanton scored. Nevarrr seen so many arrrrrrrrs in one threarrrrrd. Same old offense. 3 runs in the first then nothing. Man, Ramos is slow! Davey's fault. ...and in da drink! Scervy dog!! 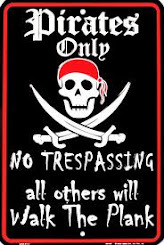 John Baur and Mark Summers created the concept of International Talk Like a Pirate Day on June 6, 1995. While playing racquetball, they began to talk to each other in Pirate-speak". After leaving the court, they decided that there was a need to create this day. After much thought, Mark Summers selected September 19th as the date. This was his wife's birthday. So, he thought it would be an easy date to remember. I want Span to get a hit just so I can stop getting a freaking text everytime he's coming up to bat.